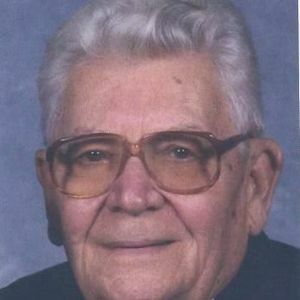 GREENVILLE - Randell Vaughn, 89, of Greenville, died Friday, June 1, 2012 at 3:00AM at his home. Mr. Vaughn was born May 24, 1923 in Butler County. He was a retired coal miner and a U.S. Army veteran, and was a member of First Baptist Church in Greenville. He was also a ham radio operator. Survivors include his wife, Juanita Vaughn; daughter Dianne (George) Trent of Germantown, TN; grandchildren Michelle (Wayne) Nemeth and Melissa (Chuck) Bates; great-grandchildren Hunter Key, Kelsey Nemeth, Hannah Nemeth, and Hayley Bates; and a sister, Irene Perry of Greenville. Funeral services will be Monday, June 4, 2012 at 11:00AM at Tucker Funeral Home in Central City, with Rev. Kevin Reed officiating, assisted by Shane Priest. Burial in Evergreen Cemetery. Visitation will be Sunday from 5-8PM at the funeral home. Online condolences may be made at www.tuckerfuneralhomes.com. The beautiful and interactive Eternal Tribute tells Randell's life story the way it deserves to be told in words, pictures and video. I know that you are with Jesus now, but I still think of you every day. I love you and miss you terribly and cannot wait to see you again! I love you and miss you so much! After some 35 years of almost daily communication by radio, we surely miss you and will always remember you fondly. I respect your life and service to all of us, and your spirit of good will toward your fellow man. You always helped us out if you could. We always will remember. I will always cherish the memories I have of you and even though you will not be with us here you will always be in my heart. You will be missed but not forgotten. Randy! U were like a brother. My heart is heavy right now. If only I could just bring u back and hear you voice in person. I will miss you so much Daddy. You were the best Daddy in the world. I love you. My thoughts and prayers are with your family for comfort and peace. You will be missed as our neighbor. Families are forever. You were a wonderful grandfather and father and husband. We will miss you so much!!!! Our hearts are broken but we are thankful you are not suffering anymore. I can't wait till the day I see you again. I Love you so much and miss you terribly!! !